In 2019, you need the best baseball cleats on the market. Whether you’re an infielder or outfielder, your cleats should be comfortable & lightweight that helps you to gain speed quickly. Along with that, your cleats should provide excellent grip on both dirt and grass area of the field. So, here, you’ll get to know about the lightest, comfortable, and coolest baseball cleats in 2019 that offers perfect grip on any type of field. For infielders, I highly recommend New Balance L3000v3 Baseball Metal Cleats. They are stylish, lightweight, and give an excellent grip on the dirt ground. Due to the thick tongue and debris-free construction, it prevents the sand and dirt from getting inside your cleats. If you have flat feet or wide feet, then there is nothing better than New Balance. These cleats are available in the normal version and wide version of the same size. So, if you want a wide version of a size, then you can get that. This is extremely helpful when it comes to the perfect fitting of the shoes. If you’re an outfielder, then I’ll recommend New Balance L3000v3 Metal Cleats. While, if the ground is soft, then you can also go with New Balance 4040V4 Cleats. You already know, why you need metal cleats. But, sometimes, when the grass area is soft, then metal cleats may be uncomfortable for you. The metal cleats can get stuck in the soft ground, and they can decrease your speed. So, if you want the good cleats for speed, then you should New Balance L3000v3 Metal Cleats. But, if you’re playing on the soft ground, then go with New Balance 4040v4 Cleats. When it comes to the style, the choice varies a lot. The cleats which I find the most stylish and coolest may look ordinary to you. In 2019, many brands have launched their baseball shoes that are comfortable and lightweight. From them, there are a few spikes that are good looking and worth mentioning, so that you can check them and decide whether they are stylish enough to purchase them or not. If you are looking for the lightweight cleats, then you need to think about a few things before purchasing. The low top cleats are much lighter as compared to the high tops. Generally, metal cleats are slightly heavier than the turf and molded cleats, unless, the company has done some special adjustments to reduce weight. So, for players who want lightest cleats, they should choose low top + molded cleats. The normal cleats weigh somewhere between 8 ounces to 13 ounces depending upon the size, types of spikes, and ankle support they provide. Generally, metal cleats weigh nearly 0.5 ounces to 1 ounce more from their molded version. If you prefer lightweight cleats, then Under Armour Men’s Leadoff Baseball Shoes are perfect for you. They are low tops, comfortable, and surely one of the lightest cleats on the market. Every brand claims that their cleats are comfortable. And, yes, most of the cleats manufactured by brands like Adidas, Nike, Mizuno, Under Armour, New Balance etc are really comfortable. But, in my opinion, Nike Huarache 2KFilth Baseball Cleats are the most comfortable molded baseball cleats available on the market. Nike is a well-known international brand, and they make these cleats really comfortable. To make it super comfortable, Nike used the lightweight Phylon midsole to provide adequate cushioning. They also provide ankle support that helps them to secure the top position in the comfortable cleats. Along with great comfort, these cleats offer all the features that you expect in a good baseball shoe. The infielders include First Base (1B), Second Base (2B), Third Base (3B), and Shortstop (SS). If you are an infielder, then you must be anyone from above them. The infielders have to be ready all the time because they can get a ball anytime. Their baseball cleats should lightweight, low top or high top as per the requirement of ankle support, and the most important thing is the excellent grip. The infielders may have to change their direction quickly, and for that metal cleats give them an excellent grip. The ball doesn’t come to outfielders; they have to reach the ball as fast as they can. For that, they need to run at maximum speed to reach the ball and throw it. Therefore, they need very lightweight cleats that offer superb grip on the grass area. Metal cleats are perfect for both grass and dirt surfaces. But, if the grass area is soft, then you may want to go with molded cleats instead of metal cleats. 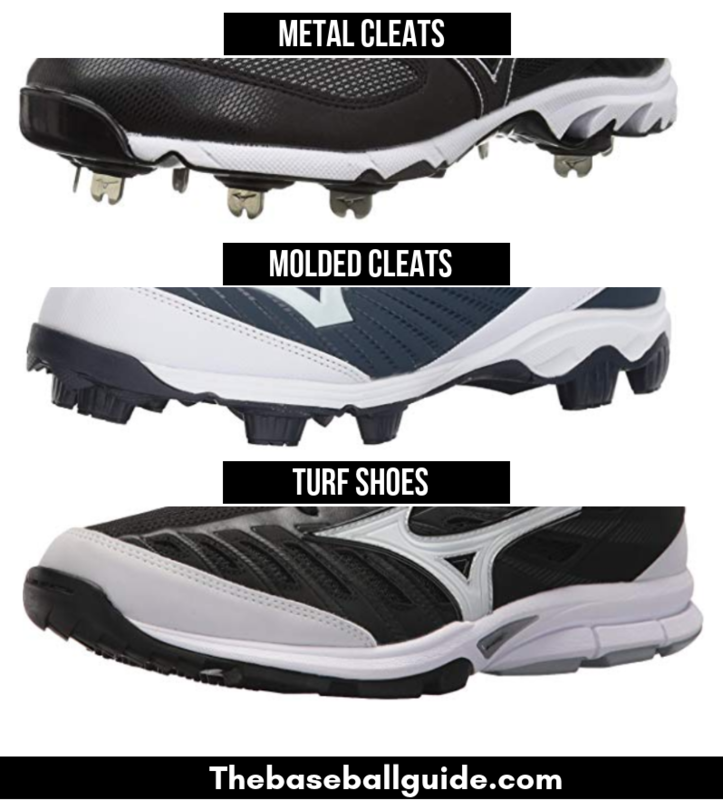 There are three types of cleats used by young baseball players. In the metal cleats, the spikes are made with metal. Therefore, these cleats provide the best grip on the field because the metal spikes can dig into even the hard dirt infield areas and the grass. Therefore, metal cleats are one of the best choices for the infielders. But, sometimes, metal cleats can also cause injuries because the cleats provide a great grip on the ground, and it can cause injuries when the player wants to change the direction suddenly. This rarely happens, but, you should be aware of that. The metal cleats are very uncomfortable when they’re worn on other surfaces like concrete etc. For the infield ground, there is nothing better than the metal spikes. However, if you love lightweight cleats, then molded cleats can be a better option for you because they are lighter than metal cleats. The best metal cleats for baseball is New Balance L4040v3 Cleats. These cleats have everything that you want in your superb baseball shoes. They are available in various cool looking designs which make them one of the coolest cleats. It has metal spikes, but still, it is still lightweight. The strategically positioned spikes give you enough grip on the surface and help you to take speedy moves. In short, they have everything which you want in the cleats. In the molded baseball cleats, the plastic or rubber cleats are permanently affixed with the sole. They are stable, strong, and provide a good grip on the dirt and grass surfaces. You can also wear them on surfaces other than grass & dirt like asphalt and concrete. The molded cleats last longer as compared to the metal cleats and they are also less expensive. They provide good grip, but not as good as the grip of metal cleats. If the surface is soft, then molded cleats are preferred over the metal cleats because metal cleats can get you stuck in the very soft surfaces, and can decrease your speed along with causing some imbalance. When it comes to the top performing molded cleats, Nike Huarache 2KFilth Cleats come to my mind. They are also the most comfortable cleats on the market. They’re lightweight, durable, stylish, and affordable too. The 12 molded cleats provide perfect grip on the surface, while the lightweight Phylon midsole makes them comfortable from the inside. If you are thinking about buying molded cleats, then you should definitely try them at least once. In 2019, Nike Huarache 2KFilth Cleats are one of the most comfortable molded cleats available. The turf shoes are also known as the training shoes because players wear them when they are practicing away from the field. These are comfortable and provide adequate grip on the artificial turf surfaces. The turf shoes keep your foot close to the ground, so it reduces the risk of any injuries. Turf shoes are perfect for the artificial turf grounds. You should not wear metal or molded cleats on the artificial turf grounds, because they can’t provide good grip and can cause injuries. Turf shoes are also lighter than metal and molded cleats. But, you can buy just any cleats because they are lightest shoes on the market. If you’re playing in a professional or high school game, then turf shoes may not be the best choice for you. The New Balance T4040v4 is one of the top-rated turf shoes for the baseball players. These shoes are available in so many different colors that you can easily pick one of your choices. You can find these shoes in almost all the good color combinations which make them perfect for all type of uniforms of any team. The rubber sole does not have metal or molded cleats, but still, you’ll be surprised to see how effective they’re in providing grip on the ground. Another thing that makes them one of the greatest shoes is that you can find a wide version of a size. If you have wide feet or flat feet, then choosing wide shoes is a good option, and in that condition, you can easily find a wide pair of New Balance Turf Shoes. 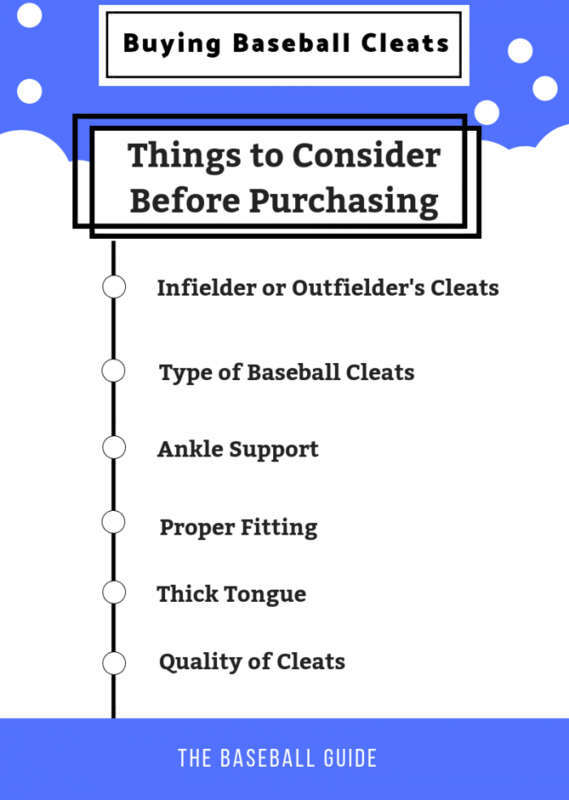 When it comes to buying cleats, the mobility of ankles is very important. The high top, low top, and mid-top cleats are manufactured by keeping the ankle support in mind. If you need ankle support, in that case, mid top or high top cleats are perfect for you as they provide ankle support. While, the low top cleats help in the mobility of the ankles, and therefore, if you want the fastest baseball cleats, then low top cleats should be your choice. The low top cleats are also lightweight as compared to the mid top and high top cleats. So, if you want cleats for speed, then go for the low top because the extra weight can decrease your speed. If you have flat feet or wide feet, and you love playing baseball, then you should consider cleats that are wider than usual, so that your foot will have enough space in your shoe. Generally, the manufacturers only manufacture one size cleats, and therefore, it becomes very difficult for the players to wide cleats. In that case, I highly recommend New Balance Cleats. They give you an option, where you can select the normal version or the wide version of a single size which is very rare in the baseball industry. If you have wide feet, then you should check my other article where I talked about the best cleats for wide feet baseball players. While, if you’ve flat feet then you should read my article about the top baseball cleats for the flat feet. The cleat requirement changes according to the position of the player. The infielders stay in the dirt area of the field, which is closest to the batter. But, according to the requirement, they may have to run on the grass area of the field, which is totally different than the dirt area. So, you need cleats that provide good grip both on the dirt ground as well as on the grass. In that case, the best cleats for infielders are the metal cleats because they provide excellent grip on both dirt and grass areas. But, if the ground is soft, then you may have to switch to the molded cleats because the metal cleats can be stuck in the soft ground, and can decrease your speed. The outfielders stay in the grass area of the field, and they have to run a lot during the game. When the ball is in the sky, they have to run at maximum speed to catch the ball and to throw it to save the game. So, outfielders require the fastest mens baseball cleats they can get. For that, I’ll recommend metal spikes along with low top is a perfect combination because the metal spikes provide the maximum grip on the field while the low top version will help in the maximum mobility of the ankles. Along with that, low top cleats are also lightweight, which is also necessary for the speedy moves. Everyone knows that there is no benefit of getting the top quality pair of shoes if they’re not of proper size. So, before buying, measure your foot size, and purchase according to the length of your foot. You should also measure the width, if you’ve wide feet, then you need to buy wider shoes. The mens baseball cleats are made of two types of materials: Genuine Leather and Synthetic. The genuine leather is more durable & breathable as compared to the synthetic leather. But, for the superior quality of genuine leather, you also have to pay more. The synthetic leather cleats are more popular in the youth because they are affordable, comfortable, and provide good support to the feet. In most of the cases, you’ll find synthetic baseball cleats because these are more preferred by the players as compared to the genuine leather shoes. Whether a certain pair of baseball cleats are lightweight or not, depends on the material used in the manufacturing. In 2019, the New Balance L3000v3 Metal Baseball Shoe is the top-rated spikes for the infielders and outfielders. The one of the biggest features that New Balance offers is the availability of different of the same size in different width. Generally, players buy the normal width shoes, but there are also many players who need wide shoes due to the flat feet or wide feet condition. In that case, New Balance comes as a savior because it becomes difficult to find the same size in the extra width. The New Balance denotes (D) as Medium size, while (W) or (2E) as the wide shoe, and (4E) for the extra wide. The synthetic leather is used in the manufacturing; therefore, it is easy and comfortable to wear. Because of the synthetic leather, it is very inexpensive. The mesh-like material that is used on the upper part of the shoe is breathable and keeps the foot from sweating and producing any bad odor. The debris-free tongue helps to prevent the debris, sand, and dirt from getting in the cleats. The 8 Spikes structure provides excellent grip on the ground to the infielders and outfielders. With this 8 spike structure, the players can run with maximum speed whether they’re fielding on the infield or outfield position. In most of the cases, the baseball shoes get damaged from the front area of the shoe. To protect that, New Balance added toe protection that provides extra durability to the forefoot of the shoe. Therefore, it’s true that they’re long-lasting and durable. This New Balance Shoe is perfect for the infielders and outfielders because it provides excellent grip on both types of grounds whether it is dirt or grass. With these spikes, outfielders can run with maximum speed to reach the baseball, while the infielders can get the full support from their cleats when they need to give a quick reaction according to the fast coming baseball. In my opinion, New Balance L3000v3 Cleats should be the number one choice for infielders and outfielders. These baseball spikes have a synthetic sole, and they’re very comfortable. But, if you have wide feet, then they’re not a good fit for you. They are slightly narrow, so, if you have normal feet or narrow feet, then they’re perfect for you. The low top construction makes the lightweight, just 11.4 oz. and supports all the sudden ankle movements that may require in the infield. These are not metal cleats; they are rubber molded cleats that provide optimum grip on all type of surfaces whether it is the dirt ground of the infield area or the grass surface of the outfield area. They may not provide you the excellent grip like the metal cleats, but there are some cases, when you don’t want to use metal cleats, in that situation, you’ll need molded cleats. For that, Under Armour is one of the best choices you have. The mesh tongue makes your feet cool and dry during the game by increasing the breathability. For added comfort, a Full-Length EVA midsole is present. In these cleats, cushioning is properly distributed to provide comfort and handle the pressure when you wear them. The synthetic leather is used in the manufacturing of these cleats, and therefore, they are not costly. These Under Armour Molded Cleats may not provide the excellent grip like the metal cleats, but if you are playing on the soft grounds or if your league doesn’t allow the use of metal cleats, then it is a perfect option for you. These are one of the best molded baseball cleats in 2019 to achieve maximum speed because they are lightweight, provide great grip on infield & outfield, and they’re low top to enhance the ankle movements. They are also very stylish, you’ll love the look. If we talk about the price, then they’re affordable, you can easily purchase them. Mizuno is one of the most popular brands when it comes to baseball spikes. Mizuno Company is not as large as Nike or Adidas, but when it comes to youth baseball cleats, young players prefer Mizuno over many big names. These Mizuno Elite 7 Metal Cleats made with synthetic leather to cut the cost and to make them affordable for the young players. These are low top cleats that reduce the weight and enhance the ankle movements. The 9 spikes are strategically positioned that gives the perfect grip for running, throwing, and sudden change in the position. Therefore, the Mizuno Elite 7 Cleats is a really good option for the infielders. The breathable mesh tongue keeps your feet dry by allowing the passage of air. There are various color combinations from which you can choose according to your uniform. A lot of people ask that whether the metal cleats are removable or not because the removable cleats are very easy to clean. But, unfortunately, these metal cleats are non-removable. The cleaning of these baseball cleats is also very easy and straight forward. The 9-Spike Configuration provides a great traction and grip on the field. Therefore, whether you play infield or outfield, Mizuno Elite 7 Cleats is a good option for you. They are also one of the most inexpensive metal cleats that are of supreme quality. They are totally worth the price, so before buying any cleats, you should take a look at them. This is a mid-cut baseball shoe with molded cleats. This is a perfect pair of baseball shoes for the outfielders if the grass area is soft. In the soft grass area, if you wear metal cleats, then you may not feel comfortable, along with that, those cleats can get stuck in the ground. In that case, molded cleats like New Balance PM3000v3 are perfect. In these cleats, 75% synthetic material is used, while the other 25% is made with mesh. Some players complain that their shoes get damage from the toe area; therefore, New Balance adds toe protection in their baseball shoes. If you are a catcher or pitcher, then they are extremely helpful, but even if you are outfielders, even then, the protection is helpful. So, whether you want to wear them as your catcher cleats or pitching cleats, they’re good for you. In most of the cases, the shoes get damage from the toe area, and because of toe protection, their cleats can last longer as compared to the shoes without toe protection. Whether you have wide feet or flat feet, there is no better brand than New Balance for you. They give the option to select from different versions of the same size. You can get the normal shoes, wide shoes, or the extra wide in the same as per your personal requirement which is uncommon. The debris free construction doesn’t allow the dirt, dust, and debris to get inside your shoes, while the Fantom Fit provides the ultra light support and fit. These are cheaper as compared to the metal cleats, and they’re a good alternative of metal cleats if you don’t want to spend much money. These New Balance PM3000v3 Molded Cleats is a good option for the outfielders because of the hard rubber spikes. They provide excellent grip whether the ground is soft or hard. These are also available in various different sizes, and there is nothing better than New Balance if you’ve wide feet or flat feet. In my opinion, if you don’t want to buy the metal cleats for whatever reason, then the New Balance PM3000v3 Molded Cleats will be my alternative recommendation for you. They’re affordable, built for speed, and also provide you some ankle support. Nike is a world famous sportswear manufacturer which is making youth baseball cleats for a long time. These Nike Huarache 2KFilth are molded cleats, so it is good for soft grounds. These are one of the top rated baseball cleats for players who have comfort as their number one priority. If you can’t buy metal cleats, then these cleats is also a good option. These are made with synthetic leather while the TPU mesh is present to provide the comfort and breathability to prevent sweat and bad odor. They have a clean & best looking design that matches with every uniform, and a perfect combination of colors makes them looks great. As they provide some ankle support, so they’re a little bit heavier as compared to the low top cleats. But, they are not that heavy which can affect your performance in the game time. You can choose these Nike Cleats if you want ankle support, but you should know that they can be a little bit heavier as compared to the other low top cleats. You can wear them in the infield or outfield, as per your position, but metal cleats are more preferred by the players. They’re affordable, provides good grip, and comfortable. Adidas Men’s Adizero V Baseball cleats are an imported shoe by one of the most famous internationally acclaimed brands Adidas. Adidas provides optimum quality footwear, apparel and sports equipment for football, baseball, soccer, basketball, and many other sports. These mens baseball shoes are one of the top-quality shoes that are tried and tested by a lot young as well as adult baseball players. This shoe features a midsole that is upgraded to double its thickness to produce extra comfort and less cleat pressure. These are one of the lightest cleats for Baseball. These are specially built for hitters looking to stretch a single into a double. It has a lightweight, sock-like fit and a baseplate that gives astounding traction even at high speeds. These may look like soccer cleats, but these baseball cleats are different from soccer cleats. The ironskin toe cap here, provides superior abrasion resistance in the key toe-drag area which is a very comfortable and required thing for a player. Let’s have some brief idea about this shoe regarding how much beneficial it can be for one who is buying it, and is there any negative quality about this product?? Let’s find out. We found Adidas has invested so much of its latest technology and features in this particular product keeping in mind customer’s satisfaction while wearing it. It has invested some latest technologies and features like Sprintskin for the best support. It constructed of a bootee design for the proper fitting like a sock-like fitting with an awesome ankle support. It has introduced the Ironskin toe cap which provides superior abrasion resistance in the key toe-drag area which is rarely found in shoes with this range. It has also introduced Litestrike EVA which is the lightest sole among all the soles present but still, it is not the most comfortable spikes for the players. Sprintframe plate is also infused in this product with external heels which provides super optimised traction. Along with all the good qualities, we found the insole of the product to be not so comfortable. So combining all these we can conclude that the product is one of the best to be bought. Having such tremendous features, one negative quality might be ignored depending upon the customer’s view and demands. So, if comfort is your priority, then you should go with New Balance, while if you’re looking for the stylish and cool looking baseball cleats in 2019, then you should definitely give them a try. The Iconic design of Muzino 9 spike includes a configuration that can give you superior comfort, enhanced flexibility and great cushioning. The high-end technology used in Mizuno shoes helps in maintaining grips on the ground while aggressive playing and the design helps you to get the comfort and stability that you really desire for. The base of the shoe is highly stable which helps you to maintain your steadiness while playing. The new mesh upper which is two layered helps in maintaining all the flexibility and comfort and it also provides stability during intense playing exercises. The shoes are equipped with Mizuno wave technology which provides all the protection to the shocks and pressure that are sent to ankle and foot. The shoe is equipped with multiple features and high-end technology. They have a fitting tape so as to get a much better fit and feel and along with that, they are made from advanced materials so you would feel the difference and would be really comfortable when you wear them. They are light in weight and you would be really comfortable wearing them which would, in turn, help you to concentrate on the game. Really lightweight which helps you to move rigorously during the game. The high-end technologies and the comfortable spike help in maintaining the grip during the matches. Protects the ankles and legs while playing from sudden shocks. The shoes are made from high-quality materials and hence they last for a really long time. The design of the shoes is really trendy and also satisfies your trendy side. The shoes are not very durable and might wear out when you wear them too much or do too much rigorous playing wearing them. This is the best shoe for you if you are someone who loves keeping your feet comfortable. The classic design of the shoes works best to prevent your ankles or legs from all types of injuries. The advanced technologies are spread throughout the base of the shoes, which helps it to be steady and also increases the grip of the same. You can stay really comfortable wearing them and it is the best value for money. You would really love wearing them as it would not only give you some unique style and the trendy look on the field but they are extremely lightweight as well. It would help you to lift your foot easily and you can avoid all the distractions that come with heavyweight shoes. Even the spikes are perfect for a good grip but it would not come heavy on your feet. The only problem with the shoe is its durability but it also depends on the way you use it. If you want comfortable shoes, then you should try other. But, if you’re looking for most expensive baseball cleats that are super durable, then you should go with Adidas, New Balance, and Nike. The Nike Men’s Alpha Huarache Elite Baseball Cleat comes with extra comfort that you will enjoy being on the field. It furnishes a modified internal bootie, a heel and cushioned ankle to fit into you. Its nine spike design offers good stability and grip for better performance. It is a flexible gear for sure. Its full-length Max Air at the midsole assist in minimizing the stud pressure and the FLywire cables are capable of providing locked-in containment. Cushioned with reinforced skins and foam it locks into your legs quite appropriately. The beans in the heel provide good comfort and its internal cage are capable of providing good support to your midfoot, heel and ankle. You can experience a good underfoot comfort due to the molded sock liner. The midfoot and ankle strap provides better stability and locking to make you excel in the field. The open-hole houses a midfoot strap at the back which allows an easy on and off feature. The forefoot is positioned at an angle and enhances the traction. Hence if you like to excel in the diamond then go for this sports gear from Nike without a second thought. The Nike Men’s Force Trout 4 Keystone Baseball Cleats allows you to enter into the field in style. Its upper synthetic leather along with synthetic toe overlays offers you good support, maximum sturdiness, and endurance. Its phylon midsole comes with lightweight padding and minimizes the cleat pressure and offers enhanced comfort during play. It houses fast flex technology and rubber cleat pattern which is capable of delivering multidirectional grip and speed during the game. The upper synthetic leather makes a sock-like fit and the Phylon midsole offers quite lightweight cushioning. In this sport gear, the rubber cleats are much more robust as compared to the metal cleats. For better stability and robustness Trout, 4 keystone baseball cleat is one of the best options. If you play in the infield area of the ground, then you have to be very quick. You can get a ball anytime, and you should be always ready for that. In this position, your reaction should be very quick. 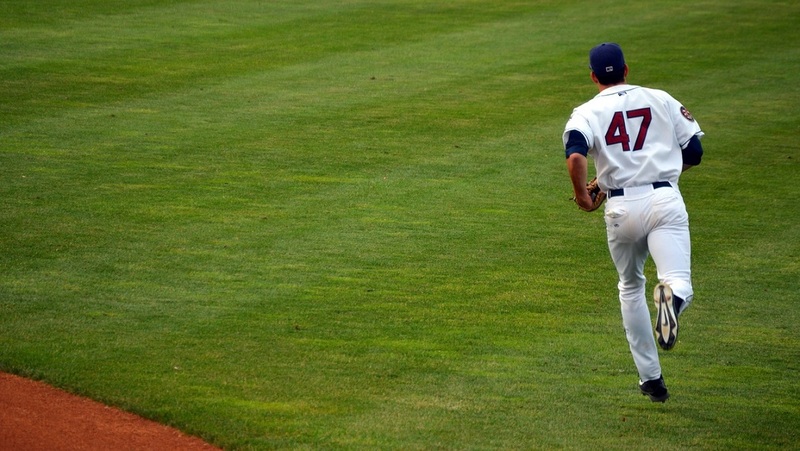 While, if you’re playing in the outfield, you have to reach the ball as soon as possible. Therefore, as a baseball outfielder, you need the best cleats to achieve maximum speed on the grass area of the ground. As told earlier, in both the areas, metal cleats are perfect because they give you the best grip on both type of surfaces. But, you should wear molded cleats, if your league doesn’t allow metal spikes or if the ground is soft because metal cleats can be uncomfortable in the soft grounds, and ultimately, they’ll affect your performance. I hope that you got some helpful information here about the both infielder and outfielder cleats. Drop a comment for sharing your views.